Do not operate the windshield wipers when the windshield is dry, as this could damage the wiper blades. Moreover, dust that has collected on the windshield can scratch the glass if wiping takes place when the windshield is dry. If it is necessary to switch on the windshield wipers in dry weather conditions, always use washer fluid when operating the windshield wipers. If the windshield wipers leave smears on the windshield after the vehicle has been washed in an automatic car wash, wax or other residues may be the reason for this. Clean the windshield using washer fluid after washing the vehicle in an automatic car wash. 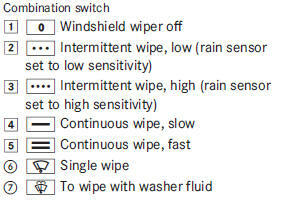 Intermittent wiping with rain sensor: due to optical influences and the windshield becoming dirty in dry weather conditions, the windshield wipers may be activated inadvertently. This could then damage the windshield wiper blades or scratch the windshield. For this reason, you should always switch off the windshield wipers in dry weather. 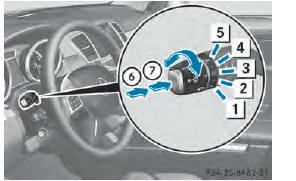 ■ Turn the combination switch to the corresponding position. causing the windshield wipers to wipe more frequently. If the wiper blades are worn, the windshield will no longer be wiped properly. This could prevent you from observing the traffic conditions. Replace the wiper blades twice a year, ideally in spring and fall.